Like many others keenly tracking the progress of art history online, I have been visiting Every Painter Paints Himself, the blog and art magazine site authored by independent art historian Simon Abrahams. Those more familiar with his work may detect a strong, perhaps grim sense of purpose in his writing. His site is divided between articles and blog entries, the two formats seeming interchangeable according to the author's whim. The chief difference a visitor to the site will observe is that the articles are closed to commentary, whereas the blog posts, despite similar themes to the articles, do have a commenting facility appended. The key to a successful blog in any genre is producing content that is unique and representative of a strong individual voice. It also doesn't hurt if the content is presented in an appealing way. In both instances, Abrahams's site is very successful at achieving this, something which not many art historians online can boast of. However, upon closer inspection, external observers may feel something is amiss. Much of what Abrahams says in his pieces are a commentary on academia, often pointing the finger at individuals or institutions for missing the mark. The thrust of the entire Every Painter endeavour seems to be self identification in portraiture. Namely, that an artist projects an essence of themselves into their work - be it a direct likeness, a manifestation of biographic events, symbols or past compositional patterns repeating themselves. The following video features Abrahams presenting the basic premise of his idea. There can be no denying that artists project themselves into their work. My own correspondence with Abrahams has been positive, and he is most encouraging of outsiders such as myself tackling art history online. However, laced into much of his writing is a sense of frustration of not having his work acknowledged by publishers and academia. The problems affecting scholarship and publishing are complex, and beyond the scope of any one individual or idea. There is a constant stream of ideas and projects left unfinished because of funding problems, interpersonal clashes, or a number of other factors. This is why engaging art historians to use the web is so important. I would submit Abrahams has done this successfully, and should be encouraging of others to do the same, regardless of whether he agrees with them or not. As someone who was creating art long before I read my first art history text, I thought the basic premise of Abrahams's idea was self evident. I remember sitting in front of a mirror and drawing myself at a very young age. I recall childhood drawings and stories that were variations of figures and objects from my own life. This is commonly observed in children, and during the formative years of adolescence, but also follows us into adulthood. A great example of this in popular culture is the film, The Wizard of Oz, based on the novel by Frank L. Baum. In it young Dorothy constructs a fantasy comprised of elements and persons manifested in her own life. 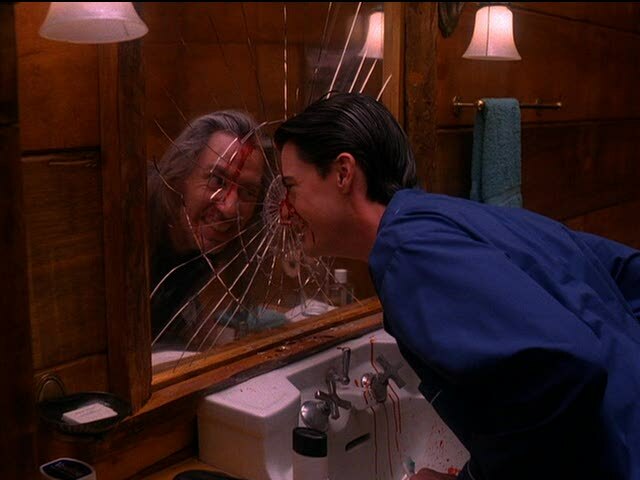 Similar themes have been explored in literature and film, from Sophocles Oedipus Rex, to Oscar Wilde's The Picture of Dorian Gray, and most of the filmography of director David Lynch. In short, the exploration and deconstruction of identity is central to the human experience, and a constant theme in the arts. Studying human development and psychosocial theory is standard to many health professionals' training. To be succinct, humans learn by mimicry. This applies to a child finger painting or a trainee surgeon learning a complex procedure. Tasks are analysed, divided into constituent phases and performed to repeat or improve upon the modelled outcome. Hence, seeing an artist, in any era, embed self references into their work, be it consciously or subconsciously is not a surprise. It reveals aspects of their formative experiences, and gives insights into the practises of a workshop. What is intriguing is Abrahams's insistence that most art historians are blind to this phenomenon. To find other academics tackling this issue, we don't have to look too far. One art historian that gels with Abrahams's outlook is University of Virginia's Professor Paul Barolsky, also writing about about self representation, but in a manner more palatable to academia, presenting it in the context of Ovidian interpretation. This is summarised in a wonderful article As in Ovid, so in Renaissance Art, also presented as a podcast hosted by the NGA Washington. This is an interesting statement, worth exploring in greater depth. At its centre lies the key factors of neuro-visual cognition, explored in disciplines extending beyond the confines of art history. The first step is to understand that visual cognition is related to basic instincts wired into the brain, present in many species. This brings to mind the work of V.S. Ramachandran, Professor of Neuroscience at the University of California, attempting to explain the congruence seen in the Venus of Willendorf and other similar objects created by prehistoric humans. This work was presented in a fabulous book exploring the interface between art and cognitive processes, The Tell-Tale Brain. Similar concepts were introduced in a 2005 BBC production featuring Cambridge classicist Dr. Nigel Spivey, which approaches the history of art in an anthropological sense. In his book, Professor Ramachandran explores these processes in great depth, all of which was sparked by relating the Venus of Willendorf to some research conducted into Herring Gull chicks. A clip of this is presented below, excerpted from How Art Made the World, with Dr. Spivey also summarising the development of human self representation pertaining to Ancient Egyptian culture. Hence, as the human brain evolved, so did the sophistication of the depictions of human form. The formations of fixed societies and civilisations inspired this change. From an evidential perspective, the greatest surviving record of this is in the art of the Ancient Egyptians. As Spivey summarises, the Ancient Egyptians developed a formulaic representation of the human body, designed to accentuate key features of human and animals, which included facial features. Inspired by the Egyptians, and incorporating the influence of Persian artisans, it is the Ancient Greeks whom history presents us with the first recorded attempts of nuanced, individualised portraiture depicting individuals beyond a symbolic representation. Perhaps the most memorable surviving traces of these are the Fayum portraits, likely painted by Hellenistic artists working in Egypt between the first and third century CE. 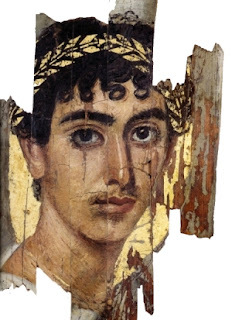 Portraits at Pompeii also reveal a wonderful range of individualised features, unlike the more rigidly stylised depictions in Ancient Egyptian and Persian art. Described in ancient accounts, painters such as Zeuxis and Parrhasius, and sculptors such as Polykleitos and Lysippus created deliberately contemplated, individualised representations of the human face and form. This description of portraiture survives from from the fifth century BCE, surely qualifying Sidlauskas's statement about portraiture being with us "for thousands of years". In all of human history portraiture has existed as an art form for little over one thousand years, no more. We read a portrait not just in terms of who is painted, but also who is painting, and how they sort out the kind of strange situation that particular encounter really is. The notion of portraiture is such a slippery one, because in many ways both the subject and the portayer want to control the event. This leaves sufficient room for Abrahams's theory. The interplay between the personality of the artist, and the realities of the studio or worksop will produce images that are similar to others, based on in-house models or other templates that are part of the process of image making. It is not a mystery, a conspiracy nor a great unknown secret. That it is not more widely discussed in academia is something for academics to untangle. One could easily say the same about art historians' utilisation of online resources, or scientific data in attributions. The solutions lie in setting an example, spreading knowledge and engendering interest in a positive manner. Given Abrahams spends the second part of his article cynically quoting negative perceptions of art history in the US, he does not stop to address what Professor Sidlauskas and many of the other professionals in the video achieved - that is to transcend the barriers of isolated contemplation of movements and their impact on the Western, Anglo-centric perception of art and its representational role. In fact, Sidlauskas's opening quote doesn't sound like art historian jargon at all, but can be equally found in texts about cognition in human and animal behavioural studies. Rather than frame the debate via a thorough assay of what the video does or does not contain, Abrahams instead chooses the easier route of selective argument - itself based on something which he proceeds to have difficulty expressing: Where is the crisis? Is it in funding? In the educational model? None of the dreaded biases we often hear about in art academia are evident in the video, Sidlauskas even spends a good deal of time quoting sources (for Ingres' Napoleon), a practice which - as has been explored previously - is frowned upon in some academic circles. Given the realities of funding cuts being made to the humanities worldwide, when an art historian takes to their colleagues with the knife in such editorials, one can only hope there is method to the madness. As an independent writer, I cannot attempt to understand what any art historian envisages the web as a medium for. Whilst a useful means of propagating information, it is also irresponsible to use it as a means of venting personal and professional grievances, particularly when repeated complaints are made about a viewpoint not being accepted. Hammering this into your readers is not the way to engender widespread change. This is perhaps the greatest challenge for art history online at this point. There are very few proponents from an academic background that are pursuing new ideas or initiatives. Common challenges will always exist - busy teaching and marking schedules, concerns about permissions, amidst genuine worries about job stability. In the interim, outsiders seem to be more successful in bringing art knowledge to the world via the web. From blogs like 3PP to the Google Art and Art.sy projects. These are the initiatives of people who observed traditional art institutions struggling to adapt to the potential of the web, and stepped in to lend a helping hand. A growing number of art historians online are making a positive impact, many of them regular visitors and contributors here at 3PP. My advice to them and their colleagues is to be more confident and encourage pupils to engage online. Students of today are best equipped to do this, already heavily involved in online interactions via social networking, gaming etc. - this should extend to include the study of art history. Fabulous things can be achieved online, often with minimal financial outlay. Passion, courage and a desire to create solutions must replace cynicism and an isolationist mentality. Clarke, J.R. Art in the Lives of Ordinary Romans. Visual representation and non-elite viewers in Italy 100BC-AD315. University of California Press. 2003. Lynch, D, Rodley C. Lynch on Lynch. Faber & Faber 1999. Mansfield, E.C. 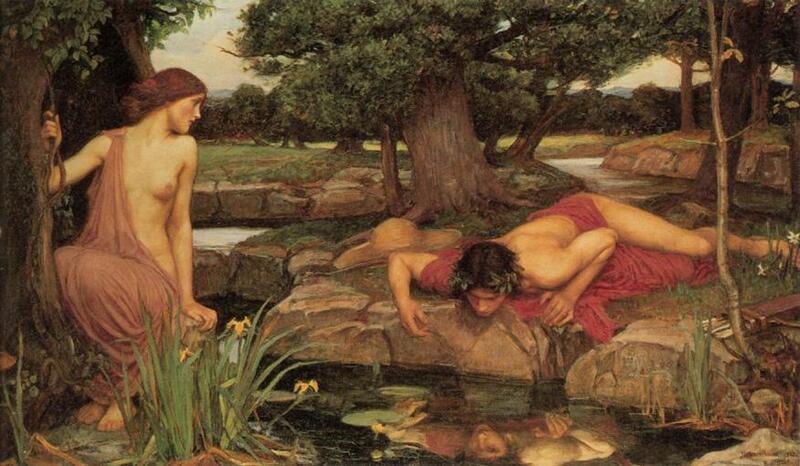 Too beautiful to picture: Zeuxis, Myth and Mimesis. University of Minnesota Press. Minneapolis. 2007. *Frame inscription for this work contains 'Als Ich Can' (As I/Eyck can) in a mixture of Latin and Greek letters, seen as a cheeky self allusion to the artist, and leading to the speculation that the portrait is of van Eyck himself. 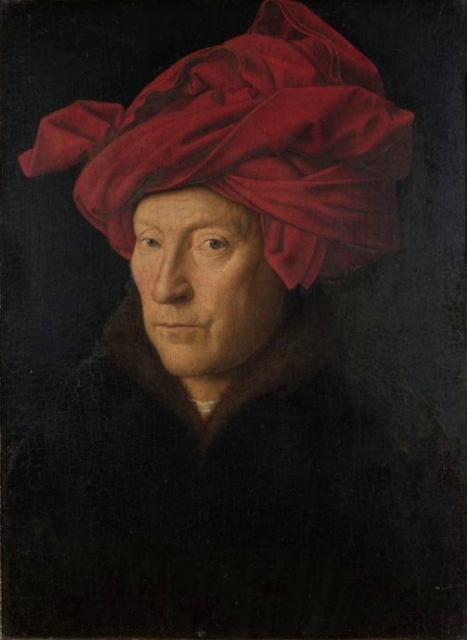 A similarly red capped figure can be seen in other van Eyck works. Interesting post. I like that Nigel Spivey clip - I show several clips from "How Art Made the World" to my ancient art students. On this topic of the human brain, I also like Spivey's clip from "The Day Pictures Were Born" episode. Spivey discusses how the spotted patterns in prehistoric caves could be linked to trances and neurological effects. Have you seen this clip? I think you'd like it. Spivey goes to the Institute of London to have his brain stimulated in a lab. He then describes to the reader the different shapes and patterns that he sees as a result from the stimulation. I agree with your comment about engendering interest in a positive manner. There are certain academic sites which I avoid or visit infrequently, largely because I end up feeling depressed or belittled by the writer's tone. (That being said, I do not have a problem with critiques on a blog, as long as they are presented in a fair way. I feel that you would agree with me, right?) Of course, I think anyone is free to write whatever they want on their own blog, but such freedom doesn't guarantee that I'll want to take part in the blog's readership! I think your point about blogs being a positive experience is an important one. Even when we are disagreeing with someone, we can still focus on the knowledge and the substance of what they are saying - nothing significant is ever achieved with soundbytes and a focus on the emotive. @Simon - I am looking forward to it. I have been asked by many what exactly you meant by "one thousand years" - I am hoping you can clarify because your original piece did not do explore this in sufficient detail. Thank you for your long critique. I had always thought that the basic premise of Every Painter Paints Himself was, as you say, self-evident. Clearly it is not. I need to do a better job explaining how visual art does not presume the presence of an observer except for very casual viewers: “Oh, that’s a nice landscape.” More serious viewers, those for whom art is made, need to forget everything they have learned about art and place themselves in the position of the artist. Here’s why. Many of the great masterpieces of Western art are depictions of the artist’s imagination conceiving the very picture we are looking at. They are never a view out of Alberti’s window. That is why neither Velazquez’s Las Meninas or Manet’s Olympia make sense as copies of the exterior world. They are both painted as though they are giant “mirrors” because, metaphorically, they are reflections of the artist’s mind. Portraits were the very last genre I understood but are the simplest to explain which is why they feature on the video. They only account for a small proportion of the site’s content, about 10%. The Essays page contains articles on the Sistine Chapel and Edouard Manet’s masterpieces. Michelangelo’s giant and magnificent visual illusion of Dante’s profile in The Last Judgment helps make sense of the entire chapel and ceiling and has been seen by all subsequent artists. Yet the last time it was mentioned by a conventional art scholar was by Charles De Tolnay, over fifty years ago. I used Susan Sidlauskas comment that “it is natural that portraiture should have been one of the ascendant art forms for thousands of years” not because the film it was made in was of any significance but because it so clearly illustrates a common misconception. The thinking goes like this: humans have always been fascinated by faces which explains why portraiture has always been a popular art form. It is wrong on two levels. Artists do not depict nature which is why, over the course of 40,000 years of art-making, portraits have been made in only 1,400 of them. It’s a case of common sense being wrong. Physiognomic portraits were made from the 5th century BC until the 4th century AD. Then they totally disappeared for a thousand years until the second quarter of the fifteenth century, only six hundred years ago. Artists, it may be useful to remember in this regard, have far more sensitive powers of perception than the rest of us and a much greater understanding of man’s place in the universe. Throughout human history artists have been shamans, prophets, magicians, alchemists, priests, all creating art as a means to help others understand their humanity, guide their souls through life and calm their fears of death. Right up until the early Renaissance there were still artist-monks like Fra Angelico or Fra Filippo Lippi, still illustrating spiritual texts within the monastery or painting altarpieces for their convent. They all believed that this world is an illusion, that the self we so crave in physiognomic portraits is a mirage and that true reality was the other side of the veil, in heaven perhaps or on the other side of the cave wall. That’s why only mere painters, craftspeople who are not poetic, would paint a portrait per se. Artists who are visual poets twist the commission, if they must take it to please a patron or feed the family, into a representation of their own mind. Anyway, many thanks for your interest. @Simon - thank you for clarifying your position. As others, (and you yourself) have observed, there do seem to be parallels between your observations and those of Michael Fried. I'm curious as to whether like him you also have studied philosophy in the past - as this is the essential nature of your premise - which perhaps explains why the historiographical approach seems a 'misconception' in comparison. Applying a psychosocial model, I would submit there is room for both to coexist under a unifying construct, which is something I hope to explore later here at 3PP. These aspects of the creative process are undoubtedly fascinating to explore. It must also be acknowledged they are subjective, philosophical phenomenon, resting on matters of personal perception and interpretation. As a result, they are remarkably hard to not only explain to others, but also to prove (some would argue proof isn't a word that needs to be considered in discussion of philosophical concepts). The perception of an artist as someone with sensory abilities beyond others is one I do not readily share as a scientist, but as a student of art and philosophy, the appearance of this being the case, demonstrated by artists' works may be validly argued. The origins of creativity lie deep within the human brain, and whilst advances have been made in exploring psycho-physiological aspects of it (see reference below for a nice intro*) it is a nebulous topic with many unknowns. Exploration of these concepts is a grand premise for a project - but I would submit that it is equally possible to do it in a constructive manner, rather setting a tone of everyone else being wrong and Every Painter showing the light. As a pragmatist, the reason I chose to write this piece is to make a point of the different schools of thought co-existing online, and art historians who have successfully embraced the web to be encouraging of others, regardless of whether their conception gels with yours. This is the essence of the dialectical approach. I am pleased that you were able to present your position in a bit more detail here.